Niagara Falls and the surrounding areas provide a wealth of opportunities for fun and adventure. Some people visit for the family friendly activities, some visit for the exceptional wine and food, and others visit to dance the night away and try their luck at the casinos. It can be difficult to see and do all the amazing things Niagara has to offer so most people have to plan their itineraries to suit their needs and the time they have during their visit. Unfortunately, that means that some activities don’t make the list. However, one activity that should always make the cut is a Niagara Falls boat ride. 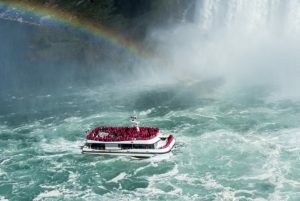 There really is no better way to experience the falls than aboard one of the boats that carries you right to the base of the falls and is a sight like no other. 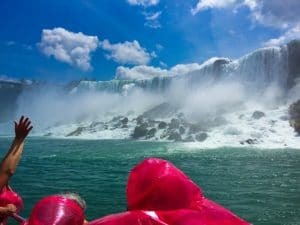 When you’re planning your visit to Niagara Falls and considering the activities you want to experience these are four reasons why a Niagara Falls boat ride should always make the cut. One of the best things about Niagara is the abundance of viewpoints where you can see the falls in all their glory from a variety of angles. This is one of the reasons why photographers love to visit; no matter where they are there’s always a new perspective from which to shoot amazing pictures. However, the shots that one can get from the boat as it cruises along the base of the falls are simply stunning. Photos taken from this perspective perfectly display the sheer power and beauty of the crashing water as it plunges into the river. Be sure to have adequate waterproofing equipment for your camera and try to get a spot on the top of the boat to avoid people’s heads in your shots. And keep your fingers crossed that you get that once in a lifetime shot of the mesmerizing rainbows created by the mist and spray. Your kids are bound to love just about everything during their trip to Niagara Falls, except the always inevitable bedtime. But a Niagara Falls boat ride is something that is bound to elicit squeals and howls of joy and wonder and you as a parent always love to see that in your children. Kids don’t care about their hair getting wet, they don’t care that there’s water in their shoes, all they care about is the incredible sight of millions of gallons of water falling down right in front of their eyes. You can prepare them with a little bit of knowledge about the geology of the falls but at the end of the trip when they’re soaking wet and grinning from ear to ear all that matters is that they just had one of the best experiences of their young lives. One of the most iconic and memorable moments in the television world was the perfect episode of “The Office” when Pam and Jim got married on a Niagara Falls boat tour. If you and your partner are willing to almost literally take the plunge at the base of the falls, Niagara Cruises can make that happen, although it might take more planning than it did for Pam and Jim. Another great idea is to arrange a marriage proposal while on the boat. Imagine yourself down on one knee as you propose to the love of your life, all the while surrounded by the spectacular beauty of the falls. This would definitely be a truly special experience and one that the both of you will never forget, but consider hiring a local photographer to document it for you anyway. Perhaps not everyone gets excited when they realize that they’ve had an experience or been in a place where celebrities have also been, but for some people it’s an “I was there too” moment. Countless famous people from royalty to movie stars have taken a Niagara Falls boat ride and you can add your name to that iconic list. Princess Diana took her young sons, William and Harry, on a Niagara boat cruise. Marilyn Monroe and Robert Redford have been there too. Famous horror writer Stephen King has added the cruise to his long list of experiences, and the actual Stanley Cup was brought on board the Maid of the Mist by Dan Paille in 2011 after the Boston Bruins claimed the win. Other distinguished guests include Stephen Hawking, former U.S. President Jimmy Carter, former Prime Minister Pierre Trudeau, Sir Richard Branson, and Denzel Washington, just to name a few. Niagara Falls is full of fun things to do for everyone but one activity that should always make the list is a Niagara Falls boat ride. Be sure to add this to your itinerary so you don’t miss out on the best way to experience the magnificent and mighty Niagara Falls.